Two Glasgow City stars were on target yesterday as Scotland defeated Georgia 3-1 in a crucial away win in their World Cup Qualifier. Scotland went a shock goal behind in the first half, with what turned out to be Georgia's only effort on goal in ninety minutes. The away side struggled with the uneven pitch and despite dominating possession could not get the vital equaliser until Arsenal's Jenny Beattie scored from close range to ease Scotland's nerves just before the break. 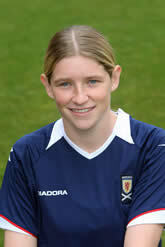 In the second half, City's Rachel Corsie headed home to make it 2-1 for Scotland and then with eight minutes left, City and Scotland midfielder Leanne Ross hit a thunderous 40 yard drive into the back of the net to get her first ever goal for Scotland and a vital three points for the dark blues.